The key component in keeping an organized bedroom is to have a closet space that’s well-designed and highly functional. A well-managed closet can keep clutter from spilling out into the rest of the bedroom, but a closet won’t always be able to handle all of your wardrobe storage needs. That’s when it’s time to consider some bedroom storage furniture ideas to help lighten the load in your closet a little. A dresser and nightstand/bedside table are some obvious examples of bedroom storage furniture most of us use. If you’re looking for some additional outside-the-closet bedroom storage furniture ideas to keep things tidy, here are a few outside-the-box suggestions. When it comes to adding extra non-closet storage space to a bedroom, it’s hard to beat a bed surround. This versatile piece of furniture gets somewhat overlooked when homeowners are considering the best bedroom storage furniture ideas. Let’s start with the valuable underbed storage a bed surround provides. The integrated storage drawers are perfect for things like out-of-season clothing, pillows, and blankets. And unlike a traditionally open underbed storage space, all your belongings will stay clean and dust bunny-free. 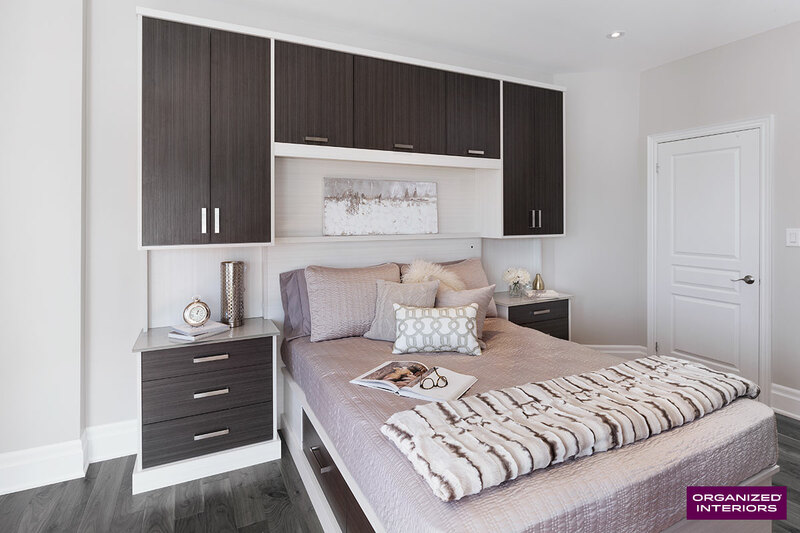 Bed surrounds can also include everything from nightstands, a headboard with cabinets and shelving storage, and even a custom wardrobe (or two). And with a bespoke bed surround design, everything from the drawer sizes, shelf widths and depths, lighting placement, finishes, and any other available features can be customized for you. A wardrobe (also known as an “armoire”) is another smart solution to turn to when you need more bedroom storage. The beauty of a wardrobe is that it can fit anywhere there’s free space in a bedroom. Some people are under the impression that a wardrobe is little more than a furniture enclosure with an extra hanging rod or two, along with a shelf. Wardrobes are a great storage option if you’re finding a shared closet space too frustrating to maintain with your partner. Create a separate storage space for one of you by adding a wardrobe to your bedroom. Bedrooms aren’t the only room in a home where a wardrobe can be added, either. They’re ideal for a playroom, storage room, guest room, or any room without adequate (or any) closet space. 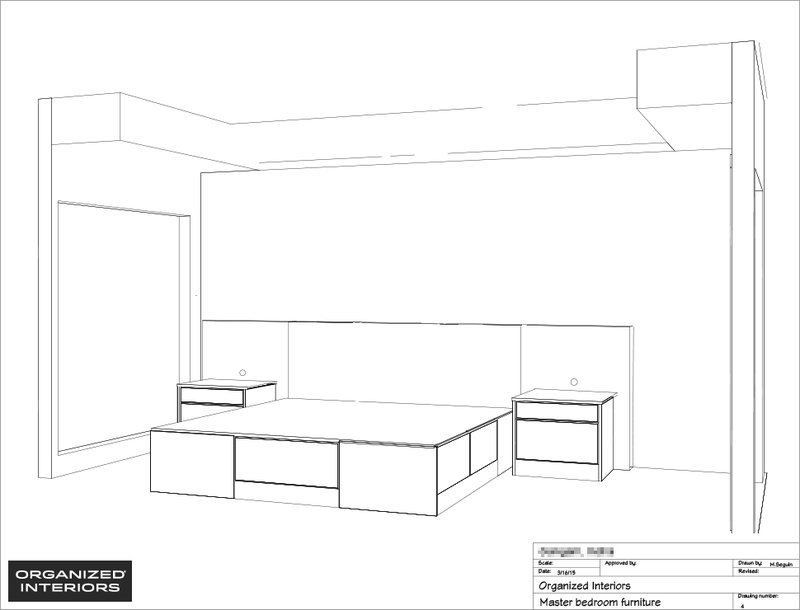 And just like a bed surround, going the custom route for the wardrobe you’re buying allows you to personalize the design to suit your needs, both functionally and aesthetically. With decorative touches like metal grill or glass doors, crown moulding, and stylish door and drawer pulls, a bespoke wardrobe becomes a beautiful furniture display piece. You might not think of a wall bed when you’re considering bedroom storage furniture ideas, but it might actually be perfect for your needs. A wall bed’s clever design is all about space-saving and nothing occupies more floor space in a bedroom than a bed. Wouldn’t it be nice to reclaim the floor space a bed takes up when you don’t need it? Wall beds (also known as “Murphy beds”) conveniently fold up into a stylish cabinet when they’re not being used. That makes them ideal for guest rooms, micro-condos, or any room where space is limited. You could also optimize your available space by creating a multi-purpose room that functions occasionally as a guest room and as a home office the rest of the time. And we’re not including wall beds on this list of creative bedroom storage furniture ideas just because the bed itself can be stored away. A custom wall bed can also incorporate surrounding drawer and cabinet storage, to really expand your bedroom storage options. 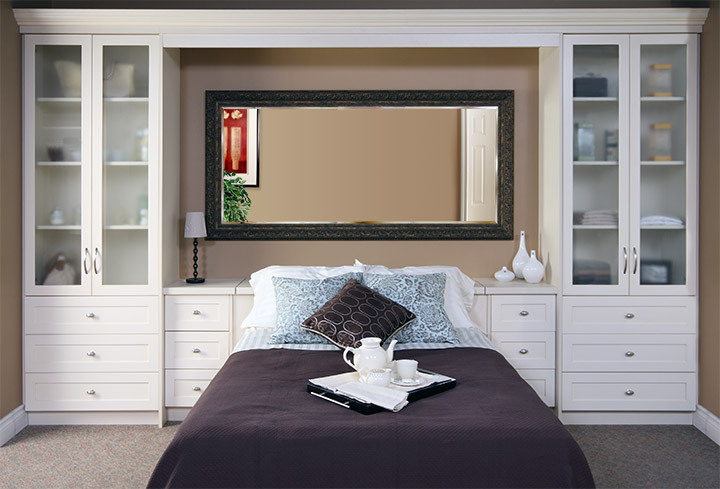 Organized Interiors has the highest quality bedroom storage furniture ideas and custom closet solutions for your home. Schedule a free in-home design consultation with us to discover how our 40+ years of organization expertise can help you to improve the storage flexibility in your home. It can sometimes require a little ingenuity to find extra storage space in the bedroom. Small bedrooms present even more of a challenge when it comes to finding storage space that helps you stay organized. That’s why bed surrounds are so useful. Bed surrounds maximize your bedroom’s storage space and functionality by providing extra storage room that’s built right into the all-in-one design of the bedroom furniture. The bed surround takes the smart underbed storage concept one step further by expanding on the design to create a larger, fully integrated furniture piece. The origin of this multipurpose, storage space-maximizing concept can be traced back hundreds of years. The cabins on ships back then were so small that a creative designer came up with the idea of adding storage space that was built right into a cabin’s bed. It was a luxury that only the ship’s top personnel got to enjoy, hence the name “captains bed”. You might think that bed surrounds are suited more to kids’ bedrooms and not meant for adults. In fact, a bed surround is perfect for kids and adults. After all, who wouldn’t want one of their rooms to be enhanced by a comfortable, beautiful piece of furniture that makes their bedroom space work harder for them? The bed surround’s valuable underbed storage design features spacious drawers that can be used more effectively than traditional underbed storage. The 6-10 inch gap underneath beds that use a box spring are typically filled with flat rolling plastic storage containers or, even worse, miscellaneous items that are just stashed loosely, with no thought given to organization. And because they’re difficult to get underneath to vacuum (and because it’s a pain to move the stored items out of the way), the area underneath traditional beds is usually filthy. Bed surrounds use a slat support system instead of a box spring, which allows for more storage space with the drawers. The drawers’ stored contents also stay protected from dust. Extra blankets, pillows, linens, toys, and clothing can be kept in the deep, conveniently close-at-hand drawers. 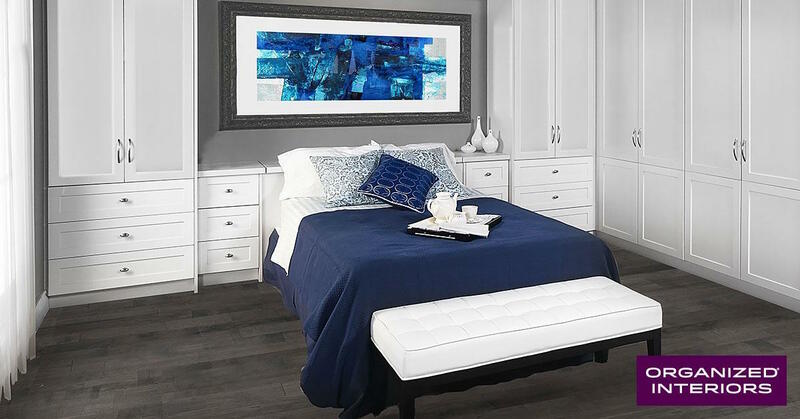 Unlike the limited one-size-fits-all selection you’ll find with bed surrounds sold at big box stores, a custom bed surround can be designed to fit your needs much better. Being able to choose what storage features are incorporated into your bed surround’s design means you’ll get a lot more functionality from the furniture. For example, say your closets and dresser drawers are full and you’re looking for more clothing storage space. This need can be factored into the design of the bed surround, perhaps by incorporating a custom wardrobe. How wide or deep do you need your bed’s drawers and how many of them would you prefer? Do you have a desire to really personalize the space above your bed surround with art or photos, which would call for more open shelving to be used in the design? Perhaps you want the top of your nightstand to be a little bigger to allow enough room for the numerous items that will be kept there, such as eyeglasses, an alarm clock, books, or a tablet or phone. The beauty of custom bed surrounds is that your specific needs can usually be accommodated. Having a lot more bedroom storage space is nice, but you also want your new bed surround to enhance your bedroom’s décor. That’s one of the other major benefits of choosing a custom bed surround. Organized Interiors’ custom bed surrounds complement any room’s style, whether it’s traditional, contemporary, or modern. Choose from a huge selection of finish colours and styles to achieve the look you want. A number of other customization options allows you to adorn your bed surround with even more appealing features. When choosing your pulls for the drawers and doors, you can select from the largest selection of Richelieu decorative hardware in the GTA. You can add task, accent, and ambient lighting that’s useful and also really shows off the bed surround’s beautiful design. If some other bedroom storage products like a wardrobe or dresser simply can’t fit within your small bedroom space, a bed surround is perfect to make the most of your limited space. And if your large or small bedroom has awkward corners and spaces, a custom bed surround can be designed to accommodate your room’s unique layout. When it comes to practical bedroom storage ideas that can lighten the load on your closets, bed surrounds make complete sense. Schedule a free in-home design consultation and one of our design consultants can further explain how a custom bed surround can enrich your home. Is clutter and a frustrating lack of bedroom storage space an ongoing problem in your home? Well, there’s a solution that you may not even be aware of – bed surround storage. Bed surround storage is a somewhat overlooked solution for storing your belongings in the bedroom. Closets, dressers, and wardrobes tend to be the more obvious bedroom storage options, but a custom bed surround can be just as valuable. What is bed surround storage? The relatively under-the-radar nature of bed surround storage may mean you’re not even aware of what this type of furniture even is. Its name is actually quite self-explanatory, however. Simply put, a bed surround is comprised of custom-made pieces that are integrated (meaning they’re designed to join together to form one large piece of furniture that has a clean, stylish look). It includes storage space and other design features that can be added underneath and at the foot and head of the bed. Your closets and dressers may be a disorganized, overstuffed mess due to your bedroom lacking a quality closet organizer or other helpful closet accessories. Those will definitely help and adding a bed surround is another way to relieve some of the burden that your other bedroom storage spaces may be experiencing. Bed surrounds are particularly effective in smaller bedrooms that are prone to clutter due to inadequate storage space. A custom bed surround is carefully designed to utilize the maximum amount of storage space available in the area that it’s occupying. Working around the dimensions and design aspects of your bed, we create a multi-purpose piece of custom furniture that gives you more storage space underneath and around your bed area. Underbed storage is especially valuable, despite the feng shui theory that advises against it. A queen size bed takes up approximately 33 square feet of space and a king size bed occupies about 42 square feet. Why waste that prime storage space underneath the bed? When that underbed area is used, it doesn’t tend to get utilized properly by homeowners, however. Some people just stuff their loose belongings there, with little regard for organization or cleanliness (you may have noticed that area is an absolute haven for dust bunnies). If a storage system is used, it’s probably a cheap plastic flat tote that isn’t destined for a long life. These storage methods are inferior to what a bed surround provides. Drawer space that’s located underneath your bed can be designed to the width and depth that your needs require. No underbed storage space is wasted and the elimination of any open space here also gives you one less area to vacuum. Your infrequently used items stay out-of-sight, while remaining easily accessible. Linens, pillows, and out-of-season items are perfect for storing here. Bed surround storage isn’t just about making use of the storage space below your sleeping area. It can include additional storage space in the form of a wardrobe, a wall unit that has open shelving or shelving behind closed glass doors, and bedside tables. Any combination of these integrated furniture pieces is possible with our custom crafting capabilities. Along with the high functionality a bed surround provides, they’re also bring a very stylish upgrade to your bedroom’s decor. Surrounding your bed with custom cabinetry makes it the focal point of any room, especially when refined touches like accent and task lighting are added. Our wide variety of bed surround finish and decorative hardware options will effectively complement your bedroom’s existing decor as well. Working with a company that is hands-on in all aspects of your bed surround’s design and installation has its advantages. Our complete oversight of the entire process ensures you’ll receive a finished product you’re 100% satisfied with. Working with our clients, our design consultants create the bed surround’s design. Then our skilled craftspeople (who custom-build all of our cabinetry) bring that design to life. Finally, our professional installers ensure that the bed surround storage fits into your bedroom space perfectly. The finished bed surround at our manufacturing facility before delivery and installation. It’s designed with 5 oversized drawers in the bed base, a headboard containing a hidden pillow box, and 2 bedside tables. Our 10,000 square foot showroom features every product we sell. Stop by to browse all of our home organization and storage solutions and get an up-close look at how bed surround storage can make a great addition to your bedroom. You can schedule a free in-home consultation with one of our design experts to discuss a bed surround or any of our other products that will improve your home. Did you know that bedroom clutter can affect how well you sleep? Researchers have found a direct correlation between sleep deprivation and high levels of clutter in one’s sleeping environment. Eliminating bedroom clutter isn’t a cure-all for getting a better night’s sleep, but it can certainly help. A bedroom that’s full of clutter has an affect on your brain, whether you’re aware of it or not. Even someone who’s lived in messy surroundings for their entire life doesn’t simply “tune out” the clutter that surrounds them because they’ve grown so accustomed to it. That disorganized environment is being registered by our brain as a job to be completed, on a conscious and subconscious level. And the longer we avoid tackling that job, the more clutter accumulates and the stronger our feelings of guilt become over not dealing with it. These stress-causing guilty feelings have an adverse affect on you, even when you’re sleeping. Sleep cleans and refreshes your mind, releasing tension that accumulates via stress throughout your day. This process works more efficiently with fewer sources of stress, like bedroom clutter. Eliminating bedroom clutter (or at least reducing it) will give your brain one less worry to contend with, which will help improve your quality of sleep. We spend about ⅓ of our lives in our bedrooms. That’s more time than we spend in any other room in the home. Your bedroom should be regarded as a comfortable, relaxing sanctuary that enables you to recharge your batteries. Accomplishing this becomes harder when that restful environment is “polluted” with bedroom clutter. Waking up to a cluttered bedroom floor and piles of clothes draped over furniture is no way to start your day. Having these eyesores as the last thing you see before going to bed is also not conducive to sleeping well. Start taking steps to eliminate the bedroom clutter that’s having a detrimental affect on your well-being. One of your first courses of action will be to thoroughly go through your bedroom belongings and get rid of items that don’t receive enough use to justify the space they occupy. One of the easiest fixes for eliminating bedroom cutter is to simply use efficient organization and storage solutions. Equipping yourself with practical methods of managing your belongings will greatly reduce the opportunity for clutter to accumulate, as well as make your life much easier. Having lots of closet space definitely helps cut down on clutter, but it’s not an absolute essential. Even small closet spaces can see their full storage potential realized by utilizing a helpful closet organizer. If you’re lucky enough to have an unused bedroom in your home, you can convert it into a dressing room (also known as a large walk-in closet). Managing your clutter becomes much easier with a larger storage space such as this. Our designers can show you a wide range of style and storage options that will make any dressing room a beautiful and highly efficient space in your home. You can’t go wrong with one of our custom-fitted wardrobes as a storage method for eliminating bedroom clutter. 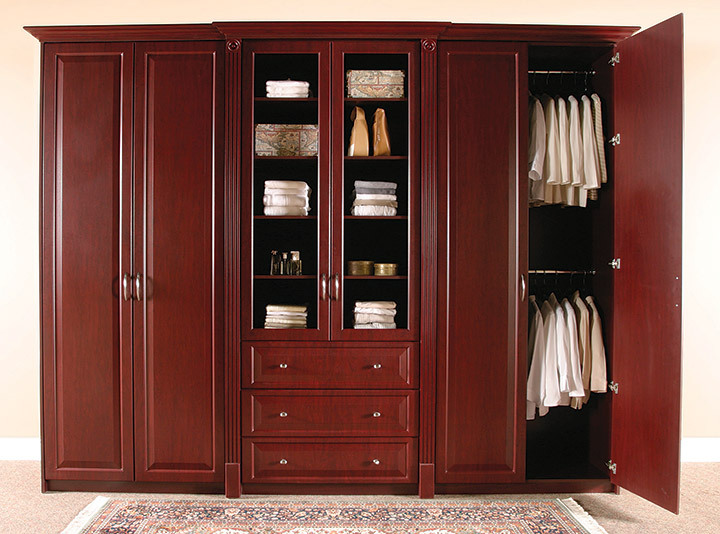 An attractive wardrobe from Organized Interiors is custom-built by our own highly skilled cabinet makers. 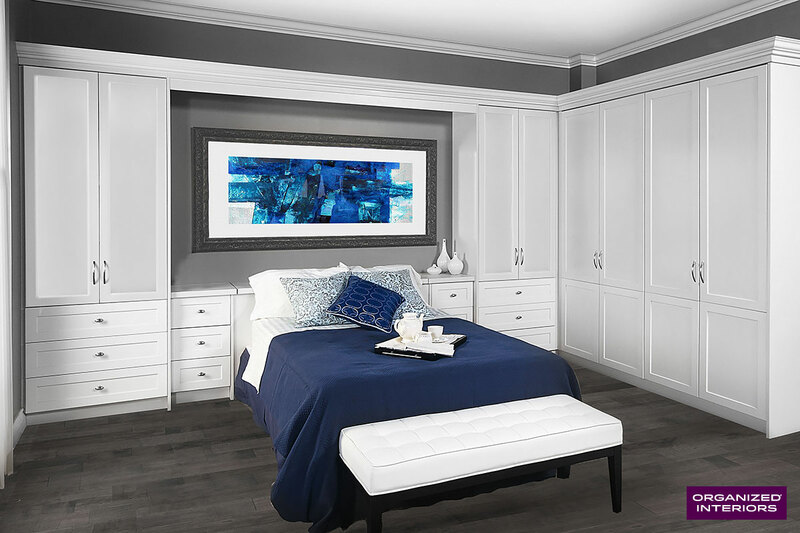 We customize wardrobes to accommodate your bedroom’s space requirements, as well as your exact design preferences. Making use of the space under and around your bed can be quite effective when it comes to eliminating bedroom clutter. Bed surrounds are a perfect way to help you do this. 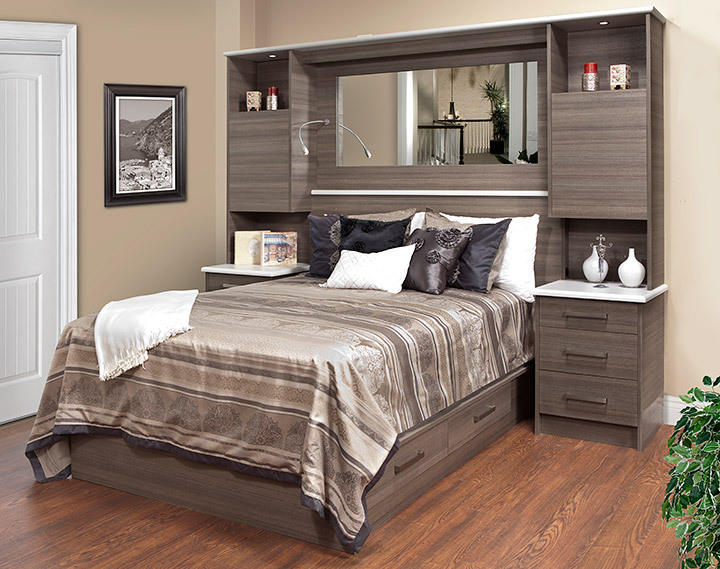 This integrated system adds drawers and open storage spaces to your sleeping area. Along with providing additional storage space, bed surrounds also nicely enhance any bedroom’s aesthetics. Life moves quickly and presents us with a host of problems to worry about, which takes a toll on our ability to get a good night’s sleep. Having bedroom clutter be one of those problems is easily avoidable, however. Decluttering your bedroom helps to declutter your brain as well, so let Organized Interiors help. Schedule your free in-home consultation with one of our design experts to get started. If the storage space in your bedroom is limited, a bed surround is a fantastic way to maximize your storage space. 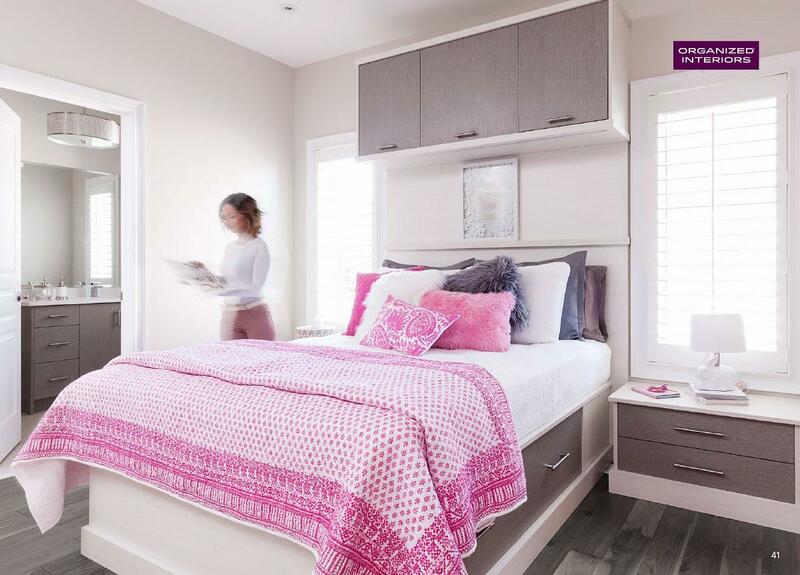 In the drawing below, Organized Interiors design consultant, Mike Seguin, designed a custom bed surround that incorporates five oversized drawers into the base of the bed. A sleek headboard contains a hidden pillow box. On either side of the bed, two night stands with double drawers contain electrical access for reading lights. Mike’s client lives in a luxurious condo and wanted something with a modern style, clean lines, and minimalistic looking, yet functional. The choice of a textured melamine board (Monaco) complements the décor of the condo. 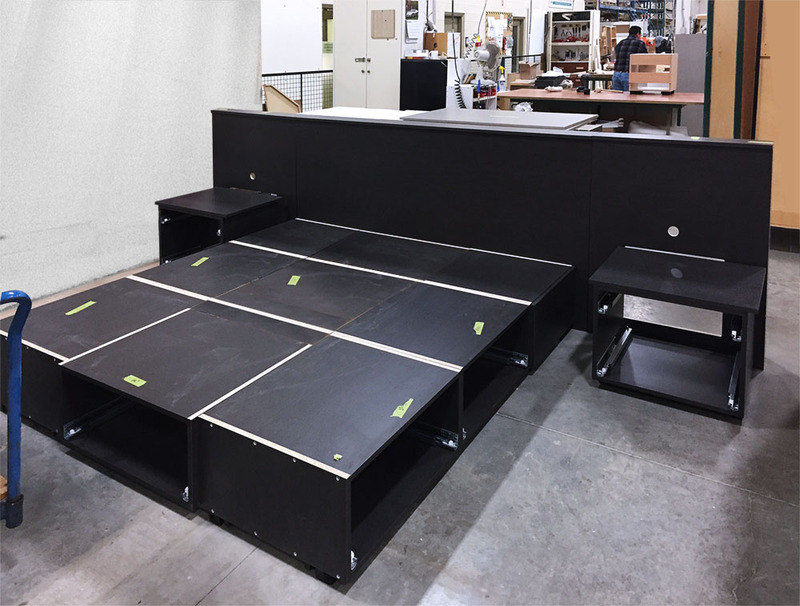 Pictured below is a photo of the bed surround in the Organized Interiors manufacturing facility, ready for delivery and installation. If your storage space is at a premium, a bed surround is a great solution. There are dozens of finishes to choose from to match your personal taste. Visit our showroom and talk to one of our design consultants to learn more.